“Blaydon Jazz Club has a well-deserved national reputation. It is a very special place for musicians and their audiences”. Dr James Birkett, jazz guitarist and educator. 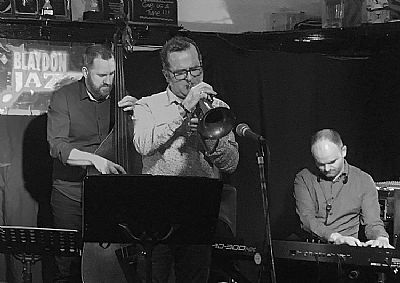 "The venue was jammed full of engaged, intelligent jazz fans and the reception was warm and friendly". Nigel Price, UK award winning jazz guitarist. On 13th September 2019 we complete 35 years of continuous jazz at Blaydon and move into our 36th year. We are one of the oldest grass roots clubs in the region, featuring mainly straight ahead jazz. Over the years we have featured many of the region's finest players and bands as well as visiting guests from the UK and beyond. The club's home is at The Black Bull pub in Blaydon, the venue where we started at 1984. The address is Bridge Street, Blaydon NE21 4JJ. On entering the pub take the door on the left into the music room. Concerts are one a month, usually on the 3rd Sunday evening, commencing 7.30 pm, finishing 10.00, but check the upcoming concerts page as there are occasional variations. 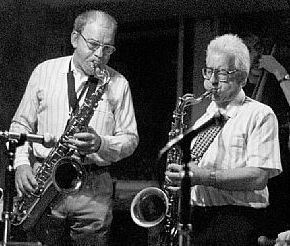 Photograph above - internationally renowned jazz saxophonist John Barnes (left) with fine local saxophonist Bill Smith. John worked for many years with UK jazz legends Alex Welsh then Humphrey Lyttelton. Over the years we have brought many of the best of the UK's straight ahead jazz soloists to Blaydon, some many times - Digby Fairweather, Roy Williams, John Barnes, Bruce Turner, Bruce Adams, George Chisholm, Mike Piggott, Tommy Whittle, Janusz Carmello, Tim Whitehead, Dave Cliff, Geoff Simpkin, Alan Barnes, Bruce Adams, Vasilis Xenopoulos, Nigel Price - this to name just a few. Above - The Early Bird Band at Blaydon Jazz Club. 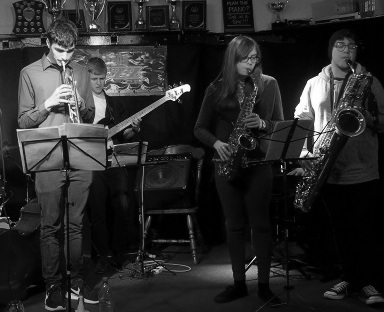 This youth ensemble is based at and supported by The Literary & Philosophical Society, Newcastle and comprises some of the region's finest student jazz musicians. The Lit & Phil also promote a monthly lunchtime jazz concert which is in a lovely setting and extremely popular. Check out their website. 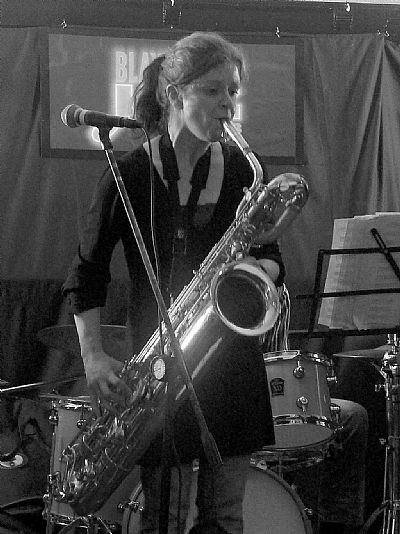 Above - the wonderful Sue Ferris, saxophonist/flautist. Above - a brilliant set from guests Noel Dennis (tpt), Paul Edis (pno), Andy Champion (bass) and Russ Morgan (drms) at our fundraiser concert on 17/3/2019. Thanks also to the Early Bird Band and Alice Grace Quartet. They all contributed to a memorable evening. One of the best we've ever had at the jazz club.